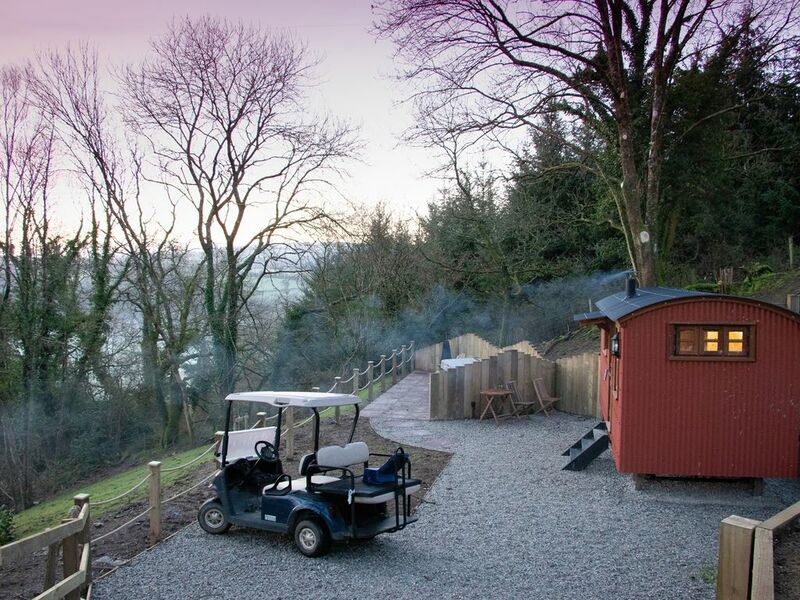 Little Silver Owl is a lovely shepherd's hut situated near the North Devon village of High Bickington. All on ground floor, with three steps up, this studio accommodation plays host to a king-size double bed, sleeping two guests. There is also a shower room followed by an open-plan living area with kitchen, seating with foldaway dining table and woodburning stove. Outside is off-road parking, Tesla electric charging point and free electric charging for cars, golf buggy for transport around site and a private lawned garden with patio area, furniture, firepit and hot tub. Little Silver Owl offers just the break for you and your loved one. Amenities: Electric under-floor heating and wood-burning stove. Electric oven and two ring hob, fridge with freezer compartment, Nespresso machine, Smart TV, Amazon Echo Plus, Audio-Technica vinyl record player, Grado and Sennheiser headphones,WiFi. Heating, power and supply of logs inc. in rent, additional logs available to purchase onsite. Bed linen, towels and bathrobes inc. in rent. Off-road parking in carpark with Tesla electric charging point (also provides type 2 connection) and free electric charging for guests. Golf Buggy for transport around site. Private lawned garden with patio area, furniture, Chiminea and hot tub. Communal grounds and seating areas. Sorry, no pets and no smoking. Shop and pub 1.7 miles. Note: There are 3 steps up to this property, not suitable for those with limited mobility. Note: There is a Good Housekeeping Bond of £100 at this property. Town: High Bickington is set in the North Devon region known as 'Tarka country'. It has a Post Office, two pubs, a holistic beauty salon and Libbaton golf course. The village of Umberleigh is only five miles away and has a railway station where trains run on the Tarka Line to Barnstaple or Exeter. Within driving distance is the town of Great Torrington, where you will find independent shops and Dartington glassworks where visitors can watch in wonder at the glassblowers. Electric under-floor heating and wood-burning stove. Electric oven and two ring hob, fridge with freezer compartment, Nespresso machine, Smart TV, Amazon Echo Plus, Audio-Technica vinyl record player, Grado and Sennheiser headphones,WiFi. Heating, power and supply of logs inc. in rent, additional logs available to purchase onsite. Bed linen, towels and bathrobes inc. in rent. Off-road parking in carpark with Tesla electric charging point (also provides type 2 connection) and free electric charging for guests. Golf Buggy for transport around site. Private lawned garden with patio area, furniture, Chiminea and hot tub. Communal grounds and seating areas. Sorry, no pets and no smoking. Shop and pub 1.7 miles. Note: There are 3 steps up to this property, not suitable for those with limited mobility. Note: There is a Good Housekeeping Bond of £100 at this property. Note: This property does not accept children.